Unless he’d blown town for another spot on the map, there’s nowhere else he could be. He’d be there watching, waiting, stalking. She’d stop him this time. She’d have to. It was, after all, her purpose in life, a world shaped by torment and obsession. It was an all-consuming calling—alpha to omega." 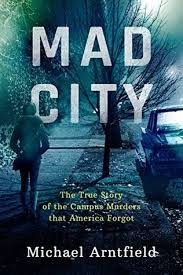 I chose to read the non-fiction "Mad City" for one reason—my personal connection to the time and place it is set. It details a series of real-life horrific murders of young women on or near the campus of the University of Wisconsin-Madison beginning in 1968, just before my first year there. Here is the Good, the Bad and the Ugly about "Mad City". Warning: big spoilers ahead. The Good. The murders that "Mad City" describes are as compelling as any whodunit. The botched police efforts to solve the murders are maddening. The decades-long mission of the first victim's friend to find justice for her is inspiring. The Bad. A huge problem with this non-fiction story is the fact that none of the murders described has ever been solved. The closest to any case being closed is the first one only because the likely murderer and only suspect eventually died of old age. He was quickly identified at the time but was never arrested (probably because of lack of evidence), or even questioned by police (which is still hard to understand). Instead, much of the book covers the unofficial investigation pursued by the victim's best friend. Even that ends incomplete decades later with the death of the suspect. A true-crime story without closure feels empty. The Ugly. This book badly needs a good editor. Or even a bad editor. It is so full of cliches, slang, padding and overblown prose that it would be comical if the subject weren't so serious. It reads like a satire of bad writing by high school students. Linda doesn't drink coffee. She takes "a belt of coffee." A bar is a "joint." Many of the cliches seem tacked onto the end of sentences just to pad the length of the book. "Enter Niels Bjorn Jorgensen, MD. Forty-two years old, a lecherous, unrelenting narcissist, and a pathological liar to beat the band. Standing a lanky six feet on the dot." One cliche is never enough. "At that time and place, for reasons beyond Christine’s control, the die was cast. The plaster had set." Some paragraphs are little more than cliches. "Cops in Madison...had squandered years saving these cases for a rainy day. Ed Edwards had always been a long shot and a tough sell, but with Lucas, they figured their ship had come in. They guessed wrong; they had missed their window; they were back to square one—again." Some sentences are factually both dubious and confusing. "For the next six days, George quite literally slept with one eye open while keeping another eye on Jorgensen’s activities at the hospital." Others are self redundant. "Intrusive thoughts intruded." Arntfield has a big problem at the heart of his story: his murders remain unsolved to this day. But that doesn't stop him from raising readers' expectations. "Come the fall of ’82, things were set to change. In a big way." Not really. "The Age of Aquarius and the Information Age were on a collision course. The impact would be seismic. It would change everything. It would wake the dead." For sure, not. The dead are still dead. The murders are still unsolved. There's a compelling story here. It's better that it's told than not. But it's unfortunate that it couldn't have had a better chronicler than Michael Arntfield. He makes a better police officer and university professor than he does a writer. P.S. The Kindle format of this book is available for free download on Amazon.